Snow days are so much fun! What could be better than staying home from school and playing in the snow? Sometimes though, kids (and their parents) get stir crazy and need another outlet for all that great kid energy. The projects below are kid tested for plenty of indoor fun! The addition of fragrant botanicals and essential oils helps to relax everyone while cleansing and freshening the air. We used the most colorful sand, all the colors of the rainbow in fact, each scented with it’s own special essential oil to create our latest works of art. All the colors and scents make for a very richly sensory experience. The kids simply loved this project! It has been a long time since I have shared a fun kid activity or recipes. Far too long! So here is our newest creation. It is all-natural (except for the glitter) and beautifully colored with powered flower petals. To me the scent of wild things, of plants and flowers is truly enchanting and brings great joy to my life. Essential oils and hydrosols capture a bit of that magic for us humans to enjoy any time. Hydrosols are the aromatic water that is created during steam distillation of essential oils. There's A Volcano In My Bathtub! What do you get when you mix an acid with a base? that they make the best of bubbly friends." This is one way that I explain the fun, interesting chemical reaction of acid/base mixing to little kids. I also make sure we talk a bit about the ph scale; where an acid and a base are on that scale; and how when mixed together, they meet in the middle becoming neutralized. Finding meaningful ways to engage children in becoming aware of and exploring their emotions is an important step towards raising confident, happy kids. And the last few weeks the kids and I filled our time together breathing deep, talking about our emotions and playing! I would like to share some of the wonderful projects we did that helped us engage our whole-selves, become aware of our emotions and find ways to center ourselves. These projects are perfect to do with young children and even have complete lesson plans for those of you working with a group of kids. Most of the projects have a bit of science thrown in while all of them offer kid-approved fun and creativity! Conduct a science experiment with essential oils to see what oils insight certain feelings. Then create a unique piece of art work inspired by an aroma of your choice! 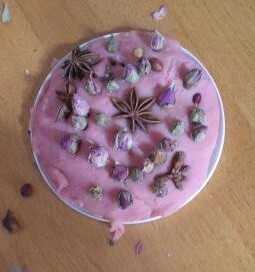 Create a beautiful fragrant meditative mandala from lovely botanicals. Create a special mind jar with a friendly face. This project helps kids learn to breathe and slow down with they feel out of sorts. A special twist on Meditation Friends that allows for even more personalization of your child's special new friend! Simple yoga play with a favorite elephant! 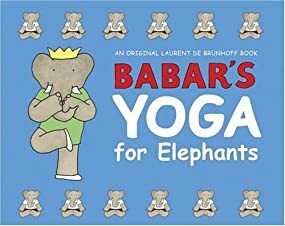 We used this super fun book to guide us through a morning of giggly yoga. Do you have any special ways to help kids learn about emotions or mindful ways of how to engage themselves? I would love to hear about them and give them a try! Wishing you lots of peaceful fun! Who doesn't like a good foot massage? A nice rub is especially relaxing before bed. Massage oils and balms made with essential oils massaged into the bottom of feet at bedtime helps to induce sleep as well as fight infection. Did You Know ~ Our bodies are able to absorb a phenomenal amount through the skin on the bottom of our feet. In fact an old remedy for coughs is to rub the bottom of the feet with olive oil, put minced garlic on top of the oil and then put socks over the whole thing. Within a very short amount of time the person's breath will smell of garlic! The garlic then helps to fight infection from the inside of the lungs out as the person breathes. What is better than squishing and squeezing a bag of gooey goodness? This is just what we did recently at preschool. The kids each created their own sleepy time foot balm in a little baggie for mixing. Originally we were going to use tins to put the balms in but what fun is that? Important Note: These essential oils are generally considered safe for kids from age 2 and up. If your child is very small and may get into the foot balm or otherwise misuse it, please store it up out of their reach when you are not in the room with them. Essential oils are not safe to use internally. Place a big spoonful (about a tablespoon) or two of the shea butter and coconut oil in a baggie. Let the children smell the essential oils and pick out a couple of their favorites that make them feel relaxed and sleepy. Add these essential oils to the shea butter/coconut oil blend. Because this is a really loose project with no exact measurement for the shea butter/coconut oil blend, I errored on the side of too little essential oil, to be safe, rather than risk using to much. So I used up to 6 drops of essential per baggie. This means that if the child choose lavender, cedarwood and ylang ylang for the essential oils, I put 2 drops of each oil in their baggie for a total of 6 drops. See Essential Oils for more information on using them herbal preparation safely. Seal the bag shut tight! Now for the fun part... Mixing it all up! It is the child's job to mix up all that goodness by squishing it around to their heart's content! At bedtime rub a little bit of the balm on the bottoms of your child's feet. This is a great time to connect with a little massage and conversation or lullaby. Then cover your child's feet with socks. Off to slumber land they go! Nightmares And Night Terrors, What's A Mama To Do? Flowers 'n' spice and everything nice went into these lovely little mandalas! "What's a mandala Ms. Angela?" was the immediate question I received after telling the kids what would be making together. While showing the kids a mandala coloring sheet I brought in for them, I explained that a mandala is a circle with a center. It has patterns. "As you work on a mandala," I explained, "you become calm and reflect on the beautiful parts inside yourself." Inspiration for this project came directly from Nuture Store's wonderful post about Play Dough Rangoli Mandalas. The instant I saw these mandalas I knew I would have to make them (with an herbal flare) at the preschool as part of our unit on Mindful Self Care. Pretty botanicals to design with ~ we used baby rose buds, hawthorn berries, star anise and tiny fragrant cardamom seeds. Set up your materials on a table. I laid out the botanicals on a paint palate and put lids in the center of the table. Give the children a brief age-appropriate description of a mandala. Have each child choose a lid and write their name on the bottom. Give them some play dough to press into their lid. Remind them that a mandala is a circle and to press their play dough up to the edges of the lid. You might need to help really little kids. Then let them design! You might want to tell the children to press the herbs into the play dough so the herbs will stick. On a separate table, if you wish set up coloring materials and mandala coloring sheets for the children to enjoy as well. A quick search online will give you lots of mandala coloring sheet to choose from. Our finished mandalas smelled amazing! Some of the children really got into this project. 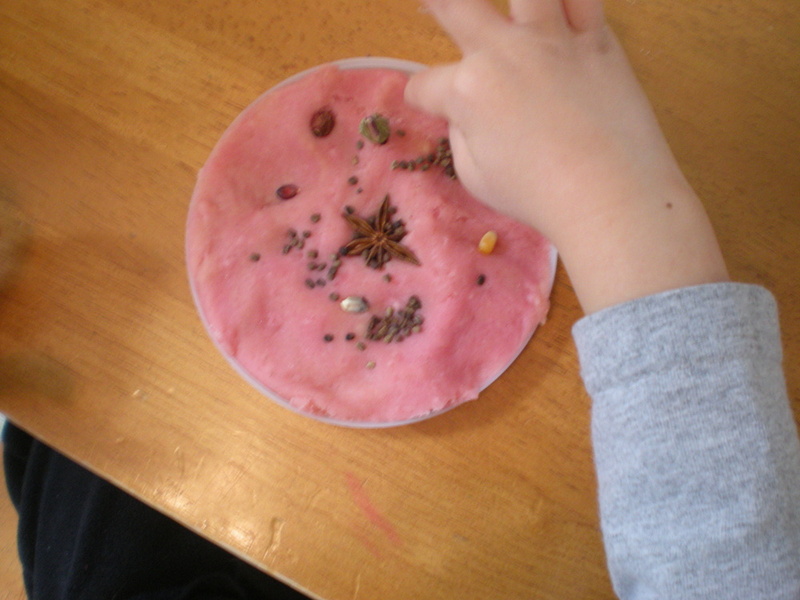 I could see and feel their minds and bodies relaxing as they carefully pressed each plant into their play dough. They would pick up a plant, smell it taking a deep breath and then place it in the perfect spot on their play dough canvas.